EcoDomus is offering a free version of its EcoDomus PM online software application called EcoDomus COBie Basic, which will help qualified design and construction teams simplify the COBie deliverable process. To qualify for using COBie Basic please submit the form on the right. COBie (Construction Operations Building Information Exchange) is an industry specification for the collection and delivery of facility lifecycle information. It provides a methodology for design and construction teams to efficiently capture and transition critical lifecycle data at closeout directly into systems that manage the operational phase of a facility. More information on COBie can be found at http://www.buildingsmartalliance.org/. The list of Owners requesting COBie is increasing, and it currently includes prominent public organizations such as the US Army Corps of Engineers and the Department of Veterans Affairs, as well as private organizations such as Kaiser Permanente and the University of Southern California. Even if an Owner has not specifically requested COBie, EcoDomus COBie Basic provides design and construction teams with a tool to deliver a better data deliverable at project closeout. The EcoDomus PM and EcoDomus FM software applications provide the ability to utilize BIM for facility lifecycle data management and analytics. The two applications share the same facility database, but provide different workflows and functionality to support the priorities of different stakeholders – PM for project delivery and FM for facilities management. The full version of EcoDomus PM provides the ability to navigate and add/edit data using our 3D BIM interface, create reusable attribute templates, perform data quality control, and integrate with the leading project management software systems. Users of EcoDomus COBie Basic can upgrade to the full version of EcoDomus PM. 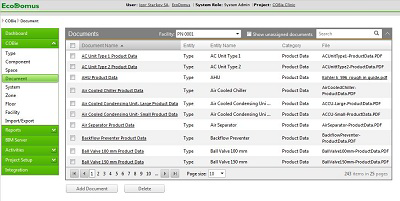 The data collected in EcoDomus PM (and COBie Basic) can flow seamlessly into EcoDomus FM to enable the integration of BIM with systems and processes used to maintain and operate the facility, such as CMMS, CAFM, BAS, GIS, and ERP. Owners can leverage BIM to improve operational workflows and facility performance analysis, enabling them to implement proactive smart building and sustainability strategies. There's more information available on the EcoDomus website.